When we last posted about our “doorbusting” project, the bathroom door was painted and had its knob installed. 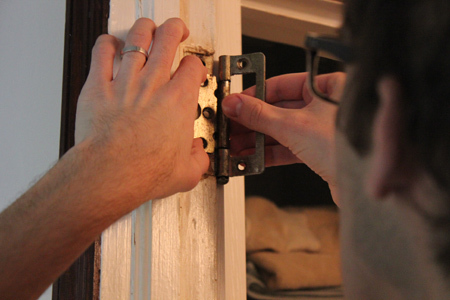 Next we needed to prep the door frame to install the hinges on the door. As you can see, the old hinges were rusty and looked as if they were installed when the house was built. On top of that when we went to replace them we couldn’t find an exact match. Instead we went with something a little more basic. OK, so that’s not our photo. I stole it from Irwin’s website. 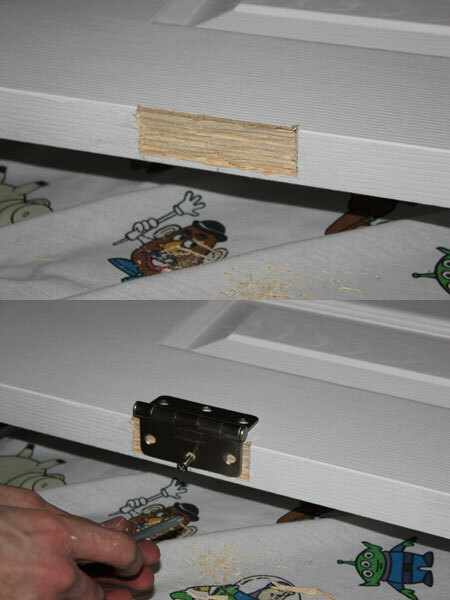 With a chisel and the stensil attached, the cutout for the hinge can be chipped away easily. And it was easy. And fun. There is some weird satisfaction that I got from chiseling, and it only got more enjoyable as the project went on. More on that later. OK, so you’ll probably notice a few things right away when looking at that photo. First, yes, that is a Toy Story blanket that we’re using to cover the floor. 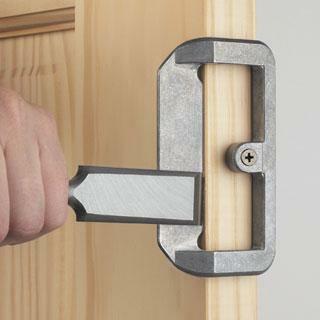 Second, yes, the hinge is a little smaller than the cut out. They didn’t exactly match the stencil, but then again nothing ever seems to exactly match with us and this house. That’s the door being hung. We ordered a custom cut from Lowe’s, and as it turns out, it fits. Not perfect, and not without some adjustments, but it does in fact fit into our door frame. Woo hoo! The door is about a half inch too short and we had some major light leakage coming through the top of the doorway. I cut this half inch piece of wood down to size and shoved it up there. Worked like a charm. It needs to be painted and the trim needs to be painted and adjusted, but that’s a project for another day. 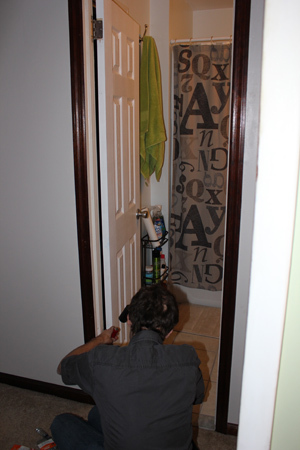 The trim was installed when the bathroom was redone and we’ve been waiting for some time to do a major trim overhaul of the whole house. So stay tuned for that. So with the door in place, and the two of us about to celebrate, we noticed the door wasn’t quite shutting properly. 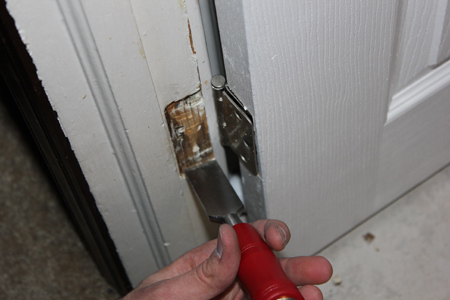 The problem seemed to be caused by the hinge cutout on the door frame. 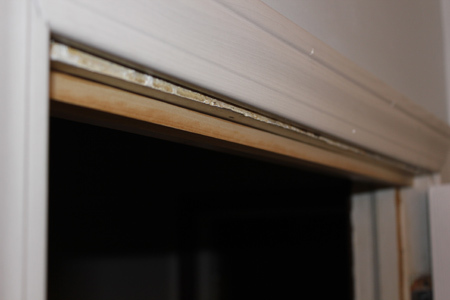 Underneath the old hinges was a layer of paint, and then a layer of stain and then the wood. This all needed to be chiseled about to make room for our evidently larger hinge. Then the door closed. Better, but not perfect. I chiseled away a little bit of the frame at the bottom and at the top around the hinge cutouts. No biggie, just a lot of chiseling. I was a little intimidated by the idea of hanging a door at first, but its really not all that complicated. The most important things are your measurements. Measure everything a million times if you need to, and measure before you cut anything. It saves the headaches. Our new bi-fold doors for the office are in, so watch out for that coming soon. And then our bedroom doors after that. And then the basement door. And then who knows?! The doorbusting never ends! Stay tuned for it. This entry was posted in Before and After, Design, Home Remodel, Home Renovation, Interior Doors and tagged home improvement, home renovation, home updates, interior doors, luan doors, painting, six panel doors by Megan. Bookmark the permalink.